I cannot find how to access this screen. When I rightclick the weapon, there is no 'Properties...' option. HOW DO YOU GET OUT OF THE WEAPONS PROPERTIES!!!! I had to close my game because i didn't know how to stop editing the weapons properties. I was done with it but how do you change back to the game??? When you place a weapon on the floor you actually place an instance of an existing weapon. You only need to set the name. 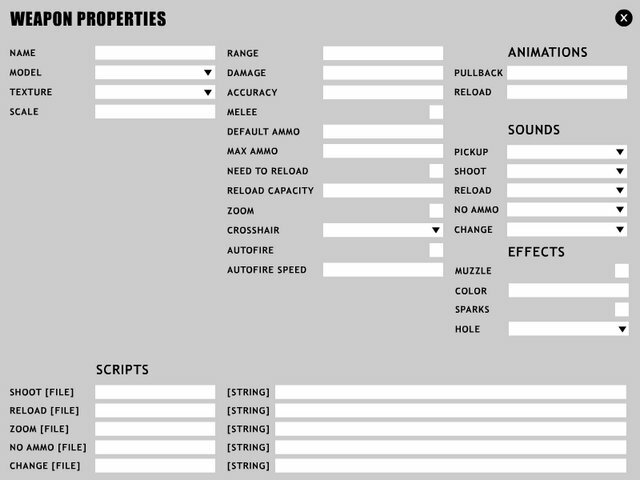 To create "parent" weapons press the "weapons" combobox where you can create a new weapon or edit an existing one. Once you have created the master weapon you can place instances of this weapon on the floor. The "END" key is the "BACK TO EDITOR" button from all sub screens. Is there a way I can make a script file run on hit? I cannot find how to access this screen.